At this point it almost seems automatic. Anytime there’s anywhere new to go it’s time to open an app. Some people swear by Yelp while others shake it to Urbanspoon. And now, of course, there’s Google Places. The search behemoth has inserted themselves in the center of a well populated space where apps tell you where the next “must-go” hotspot is, but it seems like their unique perspective could just add an element that’s been missing in location recommendation apps so far. From a layout perspective, Google Places couldn’t be anymore straightforward. 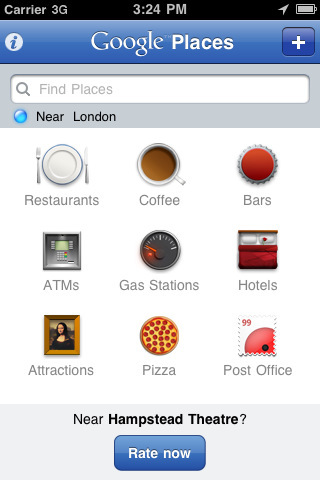 You open the app to a simple interface where your location is retrieved and Google places finds everything nearby. Small graphics lead you to quick bookmarked searches like Bars and Coffeeshops, but you can just as easily search for Bakeries or Wifi in the app’s top search bar. From there Google Places delivers a list of results organized by distance with the place name, address, a small picture, the average price, and the overall average star rating. You can click through to any location to read actual reviews, call the venue, get directions on a map, and more. Google Places pulls reviews from various places on the web, lending more than just average credibility to the ratings of the spot in question. Instead of delivering conventional ads like most free apps do, Google Places uses the bottom edge of their homepage interface to ask you to rate a particular location near you. Although I thought this might be a little interruptive initially, the display actually turned me onto a new bookstore that was definitely worth visiting. 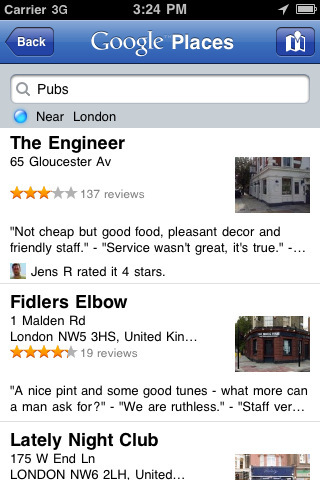 Google Places meets all the rest of the stock recommendations you would expect out of any places app. You can save search queries to your screen (they’ll just be a blue and white button of the first letter of your search) and check out other locations by clicking on the text location in the homescreen and then dragging your finger over the map until you’ve reached your desired neighborhood of choice. While this doesn’t seem like the best way to search places afar, this is perfect for urban dwellers trying to focus in on a particular area of interest. One nice feature about Google Places is the fact that it doesn’t just deliver restaurant recommendations. You can also learn about museums, theaters, and just about anything else of interest all from the same place. This is great, but where Places seems to be jumping ahead of all the rest is in their ability to deliver tailored recommendations. 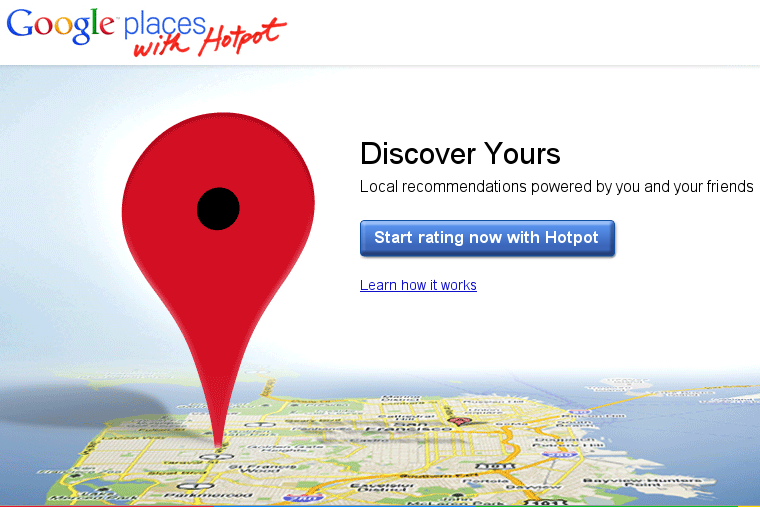 Google Places connects to an online hub for personalized ratings and recommendations called Google Hotpot. At Hotpot you can build a profile name and upload a picture, and then rate places and get recommendations from your friends. Google keeps track of your ratings contributions with a counter in the header of the page, and the more you contribute to the community the more future search results will be tailored to your tastes. The whole setup integrates some basic game theory, but for the most part it works. Your commentary may make their platform stronger, but the customized results you start to see are somewhat impressive. I can’t testify for the accuracy of Google Places’ recommendations for everyone, but I imagine the intelligence of the platform will only improve over time. Google Places is definitely worth a download. Bottom Line: Google Places only adds to our list of apps to check before choosing a dinner spot, but the recommendation engine (depending on how well it’s executed in the long term) could very well make it the most important.